As a member of the raptor electronics team, my job consists of working with my teammates to design, build, and implement the lighting features of the raptors. As you can see from the design photos included in this blog post, the cyberpunk raptors include several glowing wires and strips. In order to accomplish this effect, my team and I researched two electronic components, electroluminescent (EL) wire/tape and LED strips. In deciding which one to use, we took several factors into consideration. 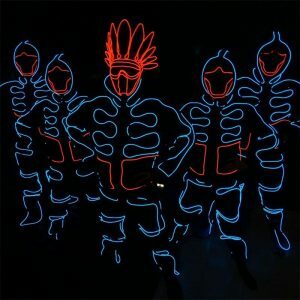 An example of EL wire used in costumes. 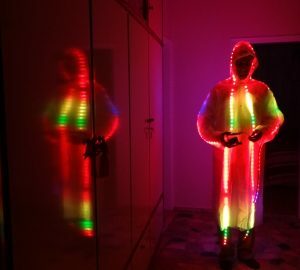 An example of LED strips used in a costume. While both EL wire/tape and LED strips are essentially strips of light, there are a few important differences in the way they look. EL wire and tape produces a solid line of light and color, while LED strips have discrete points of light from individual LEDs. For our purposes, we are going for unbroken lines of light, so EL wire wins in this category. It is possible to achieve a more solid line effect with LED strips by purchasing strips with more LEDs (meaning less space between the individual LEDs), however these strips are more expensive. Additional considerations for appearance include brightness and color. LED strips are the clear winner in this category, as they can easily change color and brightness while EL wire and tape can only be one color and level of brightness. EL wire and tape is cheaper than LED strips. Prices fluctuate depending on brand and quality, but EL wire and tape hovers around $1-2 per meter while good quality LED strips are more like $5 per meter. We are going to need quite a few meters of light for three six-foot-tall raptor suits, so EL wire/tape wins in this category. LED strips require significantly more power to operate than EL wire and tape. This means a larger battery pack for the LED strips, and consequently more weight on the raptor costumes. Additionally, EL wire and tape does not heat up while in use, while LED strips do. Performer comfort is one of our priorities in designing the costumes, so EL wire and tape wins again in this category. Although at this point it seems as though EL wire and tape is the clear choice for our project, one last important consideration is control. LED strips can be easily hooked up to an Arduino or other microcontroller and programmed to blink, change color or brightness, or pulsate. EL wire and tape can blink, but it is not meant to change color and brightness, so LED strips win in this category. That being said, there are online tutorials such as this one and this one that allow EL wire and tape to be controlled more like LED strips, and this is definitely something my team and I are going to explore further. All things considered, we decided to use EL wire to light up the raptor costumes. There is still a lot of research and testing to be done, but hopefully this information can help other people working on similar projects!